Stories of how legends are born often become clouded in truths overlooked “in the name of the deal”, unknown details and half-facts. The beginnings of the ThunderCats property is no different. We as fans know the names of Jules Bass, Arthur Rankin and Tobin “Ted” Wolf as the producers and creator of our favourite cartoon. But there are a number of names we’re not familiar enough with. 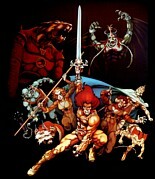 One in particular played an understated, but pivotal role in the early days of ThunderCats lore. That name is Mike Germakian. In a search I’ve undertaken to discover the name of the artist who created this iconic art piece [shown left] I had the good fortune to come into contact with Nicole Gray (nee Germakian), daughter of Mike. What Nicole revealed will intrigue you and revise your understanding of Mike’s contribution to the birth of the ThunderCats. At the conclusion of any episode of ThunderCats, credits role and the famous music kicks in. You’ll notice Mike Germakian is credited for “secondary” character designs. But this was a colossal understatement. 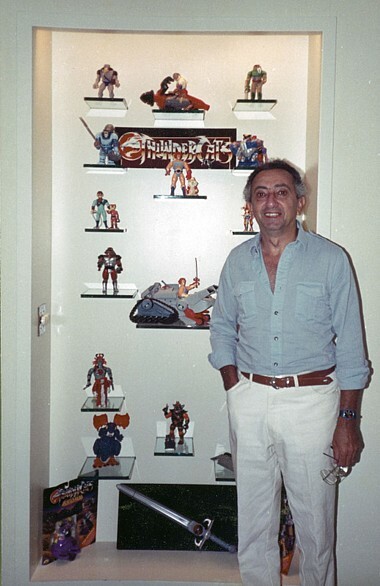 Prior to any mention of the ThunderCats, in the late 70s and early 80s Mike worked with Stan Weston, of GI Joe fame. They formed a company called Leisure Concepts which pitched toy and cartoon ideas to various companies. The company owned and licensed their ideas and partnered with companies like Rankin Bass. Stan Weston was the “deal maker” focusing on the sales side and initial concepts and Mike the “creative guy” brought life to the concepts and articulated visually to tantalize toy executives and production companies. 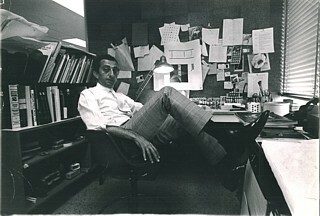 When Ted Wolf talked to Jules Bass about his idea for a show about part human/part cat people, the idea was shared with Stan Weston and Leisure Concepts was engaged to further develop. This work fell to Mike, who by all rights would more correctly have been called the Lead Conceptual and Design artist for the initial development of show ideas. While many of Mike’s conceptual ideas were changed later in the development stages he was responsible for much of the primary creation of the T-Cats including their names and descriptions of their super powers. Most significantly he developed the first conceptual drawings of the characters and their weapons as well as establishing a rough cut “power- profile” for each. As an artist, Mike worked with a wide range of styles and components. He was a masterful illustrator and graphic designer, but as a hobbyist toiled with oils, watercolors, etching and ceramic pottery-making. He even employed unique textures as seen in his use of metal nails (pictured on this page) in “The Fish.” Instinctively he tended toward strong primary colors and was heavily influenced by the great artist Picasso. His oil (seen on this page) entitled “War Hero” reflects this influence and features the unique usage of burlap depicting bandages and creating a distinctive 3D effect. Though more than one hand was in the pot as ThunderCats the concept morphed into ThunderCats the cartoon series, there can be no doubt Mike played a key role in the character design and development of the main ThunderCats characters. Though it can’t be confirmed with absolute certainty, I believe as Alice and Nicole recall, that Mike was central in the creation of the famous promo piece. It seems likely that he created the layout for the piece and then artists in Japan did the final rendering. From everything we’ve seen Mike was a highly-skilled cartoonist, illustrator and concept artist. He could easily have been a commercial success flying solo as an artist; though he chose the unique path of working with his friend and colleague Stan Weston on licensing rights for the characters/concepts they established and Mike drew life into. You’d struggle to find any other artist in the cartoon business who has pulled this off.